The plants are starting to wake from their winter slumber and the first signs of spring are becoming evident in the garden. 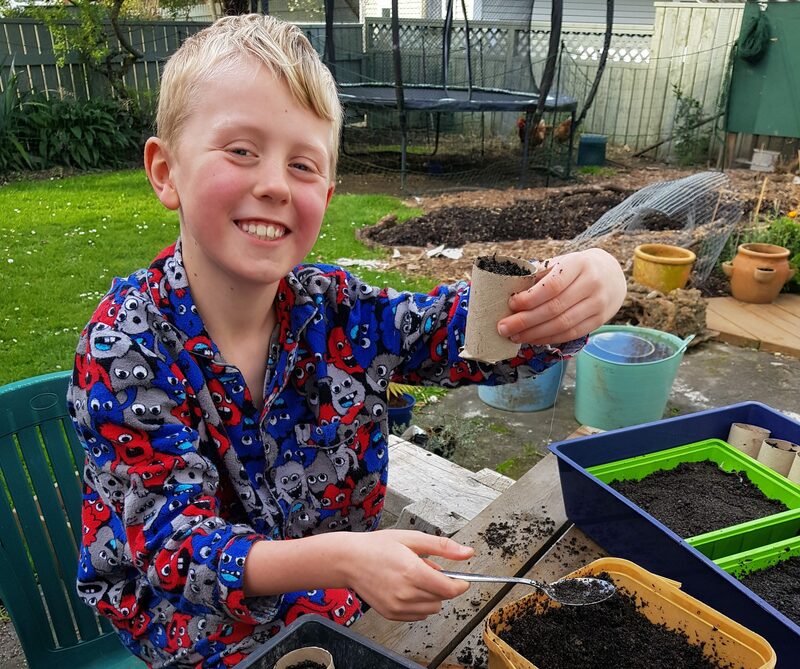 While it has been a quiet time for plant growth, we’ve made some significant progress in growing the garden over the winter months. Here is a brief summary of our winter progress. Progress on the design stalled in the middle of last year. We documented our initial steps and made loads of observations but somehow didn’t get around to drawing up the plans. However this wasn’t an impediment to making progress in the garden. Then summer kicked in and so did all the growth and the garden took up all my spare time. Taking some time to slow down again in winter has allowed me to draw up stage one of our design, which includes some temporary elements such as the current position of the chickens. It has also been good to have gained some practical knowledge of the site, which has cemented some of our ideas. I will post more on our initial design soon. 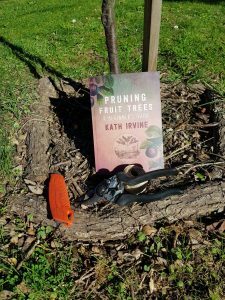 Kath Irvine’s new book, Pruning Fruit Trees has been an amazing resource.So much information packed into such a neat wee package, easily digestible and super practical. One of my key take-aways from my first perusal of the book was to encourage open growth in the center of fruit trees the ensure maximum air and light to help ripen fruit and discourage disease. I made my first attempt to train my dual plum (Black Doris/ Billington) and so far I pretty pleased at how it is looking in its tethered glory. 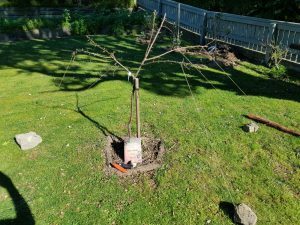 However, I seem to be procrastinating when it comes to my apples and pears, which I plan to espalier along the northern fence. I’m a little scared, as from what I can tell from Kath’s book, I’m going to have to cut back most of the vertical growth on the trees in order to encourage lateral growth. Hence, I haven’t even purchased the necessities for building the tespalier frame yet. I need to get onto it REAL SOON! The most notable winter progress has also been the toughest work. 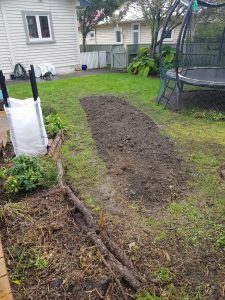 I converted a 3 meter strip of grass into the first of what will eventually become three annual vegetable beds in the back garden. 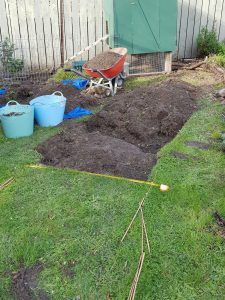 This involved double digging a strip of heavy clay grass, enriching it with composted manure, seaweed, and coffee grounds. I then created a wood chip path around the bed using a trailer-load of wood chip I scavenged locally. The bed was sown with a green crop of lupin in late July which will help to fix nitrogen in the soil and create biomass for mulch when it is cut down later in Spring. 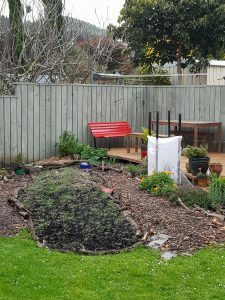 The construction of this bed and its surrounding path has completely transformed the back yard. I can now really start to feel the design manifesting and how it might feel to walk in this space when it is complete. It has also started to have an impact on how we feel about the house, how we want the house to interact with the garden and the spaces that we want to create in both. This is another first for me. 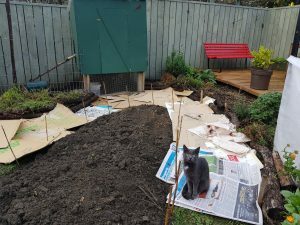 In Autumn I wrote about the permanent asparagus bed I was preparing at the front. I have recently removed the existing spent crops and am doing the final preparations on the bed to get it ready to receive the asparagus crowns in mid-September. It is VERY exciting. There won’t be any spears to harvest this year and possibly not even the next, but I am really looking forward to having my aspara-guys in situ in just a few weeks. And despite there being no immediate harvest, I’m looking forward to the masses of feathery fronds that will soon adorn the front yard. After the winter rains I was starting to feel sorry for the girls as their strip of garden was looking extremely bare of greenery. So I purchased some Omlet chicken fencing from Appletons to extend the run. Only I bought too much to use in the back yard and I now have an excess of fencing material. The chooks now have at least four times as much space as before, as well as a planted area to provide shade, shelter and a supply of bugs. Unfortunately, they have taken a liking to the taste of renga renga and have obliterated two beautiful mature specimens – but that is just what chickens do. Now that I have my first dedicated annual vegetable bed, I have started to plan crops for the coming season. The bulk crop bed adjacent to the asparagus, which gave a fine crop of pumpkins in autumn, is currently sporting a winter green crop of phacelia. This will soon host an early crop of potatoes followed by legumes (peas and beans) which will help fix nitrogen in the soil. 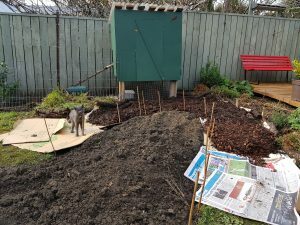 The new, recently manured vege bed is ripe and ready for a crop of brassicas and leafy greens in late Spring. Still to find a home are a couple of courgette plants and celery seedlings, which may live alongside the brassicas. And of course Dad always furnishes me with a couple of dozen tomato plants that he raises from seed – still not sure where these will live. We haven’t ignored the beneficial insects in our garden planning. 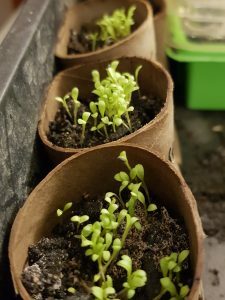 I placed a flower seed order with Kings Seeds and sowed these with my son on a sunny afternoon in August. The flowers include a number of species great for bees and butterflies including species of Coreopsis, Asclepias and Tithonia, along with a few herbal favourites like lemon balm (Melissa officinalis) and hyssop (Hyssopus officinalis). Some of these will make the medicinal herb border and the others will be planted in among my cropping fruit and vegetables. So although we have not had much in the way of winter crops in the ground, we have made some reasonable progress towards implementing and building upon our design this winter. We are still taking things slowly and being sure not to bite off more than we can chew, observing our ‘experiments’ season by season. It means that the garden is always in flux, a constant work-in-progress, but is also ensures that any mistakes that we make are manageable. Now, with the taste of spring in the air, it won’t be long until things take off again. Although it is a busy time, the longer days and fairer weather will allow even more time to increase our permaculture maturity.